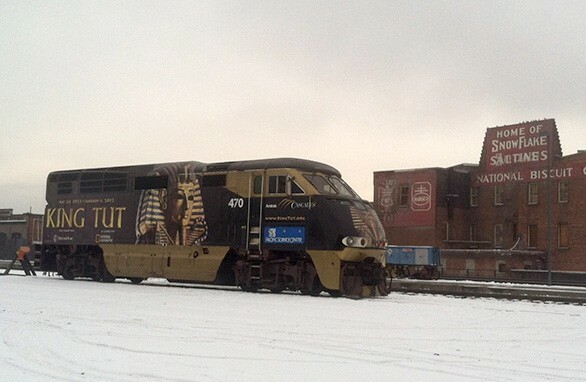 We’re used to seeing coal trains roll by our window here at the Inlander office, but last Friday morning there was a more unusual train out on the tracks: Amtrak’s special King Tut train. First off, the disappointing news: King Tut probably wasn’t in that train. The King Tut motif is actually vinyl wrapped tightly around the locomotive, according to this video segment from Seattle’s KOMO News. The theme continued inside, where display cases held exhibit memorabilia. Here’s a nice collection of photos from WSDOT. The exhibit closed on Jan. 6, and the artifacts are headed back to Egypt after a four-year North American tour with stops in Atlanta, Indianapolis, Toronto, Denver, Minneapolis and Houston. Amtrak didn’t get back to us yet about what comes next for the train — which is technically a F59PHI No. 470 locomotive, not a whole train — but Trains.com reported last Thursday that it would be leading Amtrak’s Empire Builder line that runs from Chicago to Spokane and on to Seattle and Portland. It was spotted in Chicago last Wednesday, and was heading westbound through Idaho when disaster struck: The locomotive crashed into an elk near Sandpoint, Trains.com reported, and barely limped into Spokane to be repaired. It’s no longer out on the tracks in Spokane, but we haven’t heard any sightings since the elk incident. In theory, if it’s assigned to the Empire Builder for a while, it will be coming through Spokane fairly frequently. Unfortunately for casual train-watchers, all the scheduled stops are in the middle of the night.